This product requires the base game Hyper Knights. Enemies are building an Outpost, if they succeed all is lost! 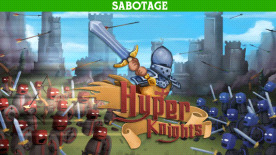 Sabotage their operation by attacking the harvesters and builders. Recruit your own units to help you. Their reinforcements are on the way, disrupt the construction of the Outpost for as long as you can! Improve your skills and upgrade your stats. Climb the leaderboards and make your mark!